To Weather Criticism, It Helps To Think Of The Big Picture : Shots - Health News Negative feedback is supposed to be good for us, but it sure doesn't feel so good. Shifting the context by thinking more broadly helps blunt the sting, a study found. So does embracing change. Think back to the last time you got negative feedback — like when your doctor suggested you lay off the cigarettes or when your mother advised you to get rid of that ridiculous goatee. Though we all understand the value of constructive criticism, we don't like hearing that we've done something wrong. And the knee-jerk reaction is to act defensive. But if you focus on the big picture and future goals, you may be able to trick your mind into being a bit more receptive. That's what researchers at the Ohio State University discovered in a study published Friday in the Personality and Social Psychology Bulletin. The researchers tried a couple of experiments. First, they divided 85 undergraduate students into two groups. They encouraged half the students think about broad ideas — for example, "sodas are a type of drink." They asked the other half to consider: "A Coke is a type of soda." Then they told everyone about the dangers of skin cancer and suggested that students who don't already do so should wear sunscreen and avoid tanning. The group that was asked to think broadly was more receptive to the suggestions, and said they were more likely to feel motivated to give up tanning. 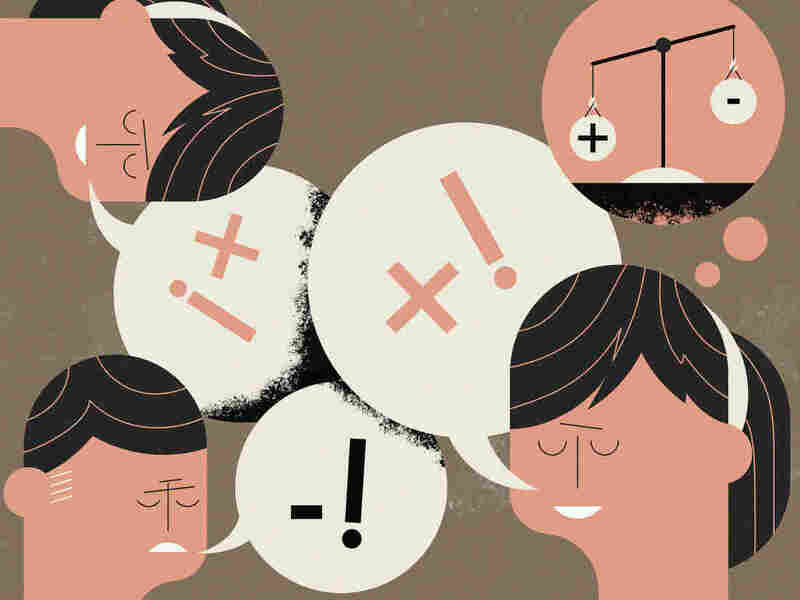 When people are thinking big, they have an easier time realizing a single critique doesn't define them, says Jennifer Belding, the doctoral student in social psychology who led the study. "It helps them step back, and realize that the person giving them that feedback is just trying to help," she explains. "But when people are thinking about the nitty-gritty details and they have a narrow mindset, it's easy for them to get caught up in the moment," Belding says. "Instead of focusing on how the feedback can help them in the long run, they think about how much that information is hurting them." "Every time I submit a research paper to a journal, it invariably comes back with tons of edits and feedback. And every time, it's easy to feel disappointed or even angry." Believing that change is possible is important as well. In a second experiment, Belding and her colleagues divided 133 students into several groups. Some were asked to think broadly about the importance of maintaining good health, while others were told to think about what they could do in the immediate future to stay healthy. And then, while some read about how skin cancer is easily preventable, others read that it was genetic. Those who not only thought broadly about their health but also believed that cancer was preventable were the most motivated. This group spent, on average, five extra minutes reading about how to avoid sun damage. It's all about perspective, says Daniel Molden, a social psychologist at Northwestern University who wasn't involved in the study. "For most people, the immediate response to criticism is emotional. They might feel threatened or hurt," Molden says. "And people don't like to feel hurt, so they'll try to deflect or undermine the critiques." A growing body of research suggests that taking a broad perspective helps people deal with perceived threats, Molden notes. When you're on the receiving end of criticism, Molden's advice is to take a few minutes to think about your long-term goals. And to think about how criticism is simply a part of life. "I can tell you, as someone in academia, I deal with negative feedback all the time," Molden says. "I've been doing this for 15 years. And every time I submit a research paper to a journal, it invariably comes back with tons of edits and feedback. And every time, it's easy to feel disappointed or even angry." Molden says he copes by letting himself feel frustrated for a few minutes. "And then I step back and reflect on how this feedback could be beneficial." If you're the one delivering negative feedback, before launching into what someone has done wrong, you might want to start with a general statement about what you think of him or her overall, Molden says. "This is relevant when it comes to public health campaigns as well," Molden notes. People tend to avoid screenings for cancer or sexually transmitted diseases because they don't want to risk hearing bad news. But they might be persuaded by campaigns that encourage screenings as part of a broader plan for staying healthy.